^ Harvey, EM. 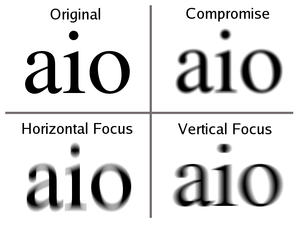 Development and treatment of astigmatism-related amblyopia.. Optometry and Vision Science. June 2009, 86 (6): 634–9. PMC 2706277. PMID 19430327. doi:10.1097/opx.0b013e3181a6165f. ^ 香港卫生署. 散 光. [2018-12-20].